The Heron Road Community Centre, Third Floor, St. Peter’s Room, 1480 Heron Road, Ottawa, is the hub of action. Come and join RTO/ERO Bridge or Entre-Nous Choir practice. • Mondays at 12:30 (Sept. to June). All levels welcome. No partner needed. For information, contact: Cecile Roy, 613.738.2421. • Wednesdays at 12:15 all year round (need a partner). 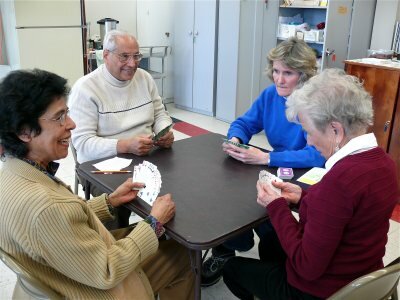 Duplicate Bridge requires a partner. For information, contact Murray Kitts 613-830-9827. • Thursdays at 12:15 all year round. All levels welcome. No partner needed. For information, contact Wendy Old at 613 224-6806..
Players at all levels are welcomed. June 8, 2018 — The top scorer was Erica Furlong. Pictured with Wendy Old (left) there was a 3-way tie among the 3 organizers for second high score.